Stoke have signed defender Kevin Wimmer from Tottenham for £18m. The 24-year-old, who has won eight caps for Austria, has signed a five-year-deal with the Potters. 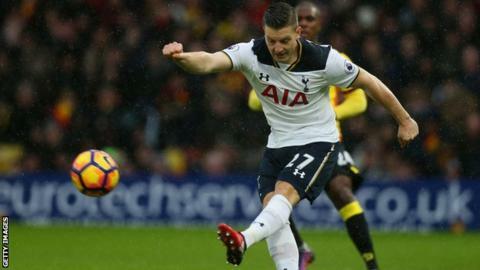 Wimmer joined Tottenham from Cologne for an undisclosed fee in 2015, but made only four starts in the Premier League last season. "Kevin is an undoubted talent. He will significantly add to the quality of the group of players that I already have," Stoke manager Mark Hughes said. Wimmer becomes Stoke's seventh signing of the summer and the fourth defender, after Bruno Martins Indi from Porto, Josh Tymon on a free transfer and Kurt Zouma on loan from Chelsea. Forward Jese Rodriguez has also signed on a season-long loan from Paris St-Germain, while midfielder Darren Fletcher and winger Eric Maxim Choupo-Moting joined on free transfers. Meanwhile, Wimmer's arrival has paved the way for Germany centre-back Philipp Wollscheid to leave Stoke, with his contract terminated by mutual consent. Wollscheid, 28, joined Stoke on loan in January 2015 and then signed permanently in May 2015 on a three-year deal, but spent last season on loan at Wolfsburg. He has now joined French side Metz.